The San Francesco a Ripa. 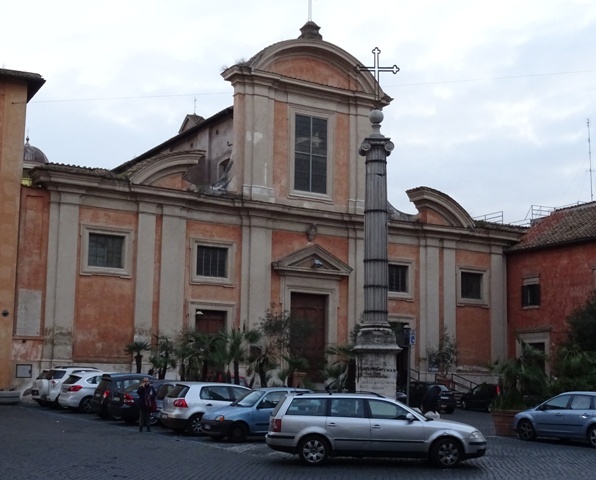 The San Francesco is small church in Trastevere, located near the western shore (ripa) of the river Tiber. It is of course dedicated to none other than Saint Franciscus of Assisi, one of the best-known and most important saints in the history of the Roman Catholic Church. His preaching was in fact so influential that he was canonised by Pope Gregorius IX (1227-1241) a mere two years after his death in 1226. The San Francesco a Ripa became the first base of the Order of the Franciscans in Rome. Long before the Order of the Franciscans was founded, a hospice and chapel for pilgrims operated by Benedictine monks existed at this location. It was known as San Biagio de Curtibus. Franciscus visited Rome several times between 1209 and 1226. At an unspecified moment in time, the San Biagio hospice became the base of his activities in the Eternal City. About a year after his canonisation, Pope Gregorius IX transferred the complex from the Benedictines, who had become seriously corrupt (cf. 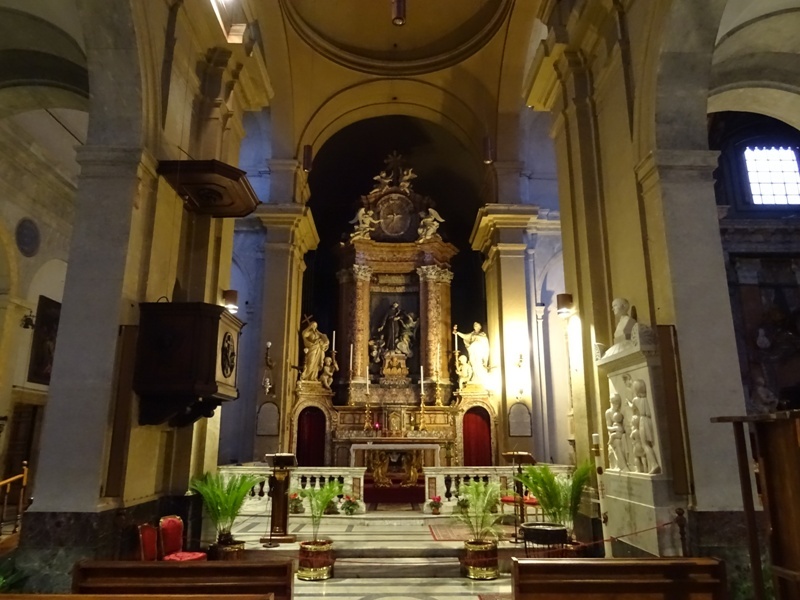 Rome: San Tommaso in Formis), to the Franciscans. Two individuals seem to have played an important role in the process and the events that were to follow. One was a Franciscan tertiary, an early follower of Franciscus named Giacoma Frangipane de’ Settesoli (‘Brother Jacoba’). She may have used her considerable influence as a member of the Frangipane clan to facilitate the handover. The other was a nobleman from Trastevere, one Pandolfo II Anguillara, who provided the financial resources needed to rebuild the church and dedicate it to Saint Franciscus. Although the San Francesco was the first headquarters of the Franciscans, they soon moved their base to the Santa Maria in Aracoeli on the Capitoline Hill when the latter church was granted to them by Pope Innocentius IV (1243-1254) in 1249. The San Francesco somewhat faded into obscurity and passed to a different branch of the Franciscans in 1579. The new friars decided to restore the church and for this they hired the architect Mattia de Rossi (1637-1695). De Rossi worked on the San Francesco between 1675 and 1689 and gave it a Baroque appearance. The present orange facade is from his seventeenth century restoration. The small Ionic column on the Piazza di San Francesco d’Assisi in front of the church was erected by Pope Pius IX in 1847. “A small column for a small square”, as the Holy Father snidely put it. The cell that Saint Franciscus used should be open to the public. I visited the church in November 2015 and arrived so late in the afternoon that I could not find anyone to show me where to find it. In its heyday, the church was part of a monastery with four cloisters. One of these reportedly has an orange tree which was planted by Saint Franciscus himself. Since I have not seen this tree either, I do not know how much of this story is true. The San Francesco once had a fresco cycle painted by Pietro Cavallini (1259-1330) in 1290. Given Cavallini’s reputation and the quality of his work in churches like the Santa Cecilia in Trastevere, it must have been splendid. Regretfully, the frescoes were either destroyed or covered with plaster during the De Rossi restoration. The church interior is plain and simple now, which is probably in line with Franciscan teachings on soberness. Surprisingly, the altarpiece in this church is not a painting by some famous artist, but a wooden statue of Saint Franciscus carved in 1550 by one of the Franciscan friars. The San Francesco is not known for its splendid works of art. The Cavallini frescoes are gone, but there is one treasure that a visitor really should see. It can be found in the Cappella Altieri (also called the Cappella Paluzzi-Albertoni). It is a sculpture by the great artist Gian Lorenzo Bernini (1598-1680) of the Blessed Ludovica Albertoni. Ludovica was a Roman noblewoman who, after the death of her husband, became a Franciscan tertiary and dedicated her life to caring for the city’s poor. She died in 1533 and was beatified in 1671. Her chapel in the San Francesco was already very popular, and on the occasion of her beatification, it was embellished. 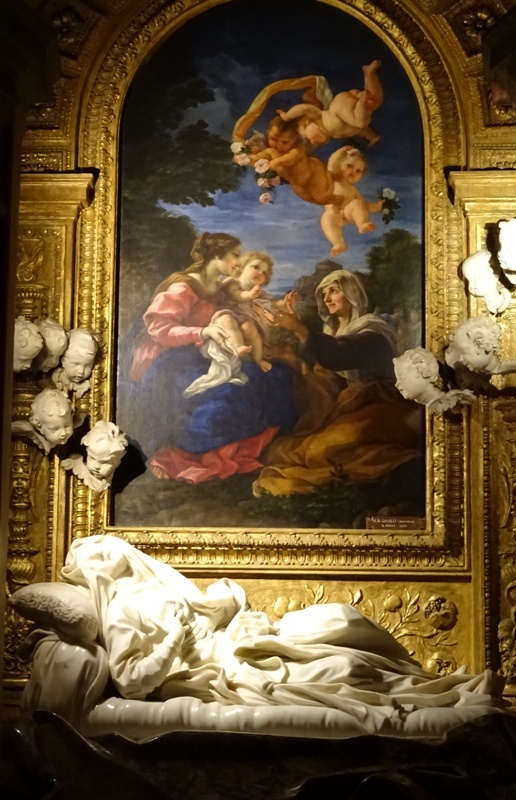 The already aging Bernini was asked to sculpt a grand funerary monument for her. The artist completed the work in 1674. The sculpture shows Beata Ludovica in ecstasy. Above her is an altarpiece by Genoese painter Giovanni Battista Gaulli (1639-1709), also known as Il Baciccia. It was painted in 1675 and shows Mary and Jesus as a child on the left and Saint Anne, Mary’s mother, on the right. The famous Italian artist Giorgio de Chirico (1888-1978) was buried in this church. San Francesco a Ripa on Churches of Rome Wiki.